You will need two and a half hours a day to complete this study in two days; however you can always expand the two-day lesson plan so that it covers a period of three to five days if you wish. 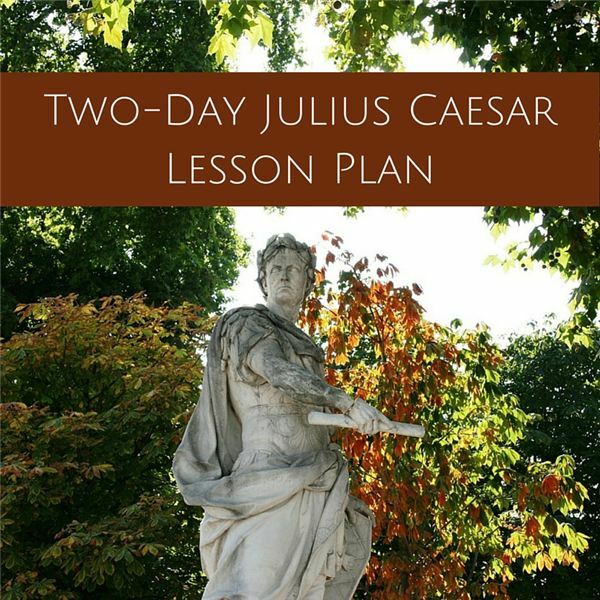 The best way to teach Caesar is by combining a literary and historical approach, so team up with your partner in the respective department and get busy! Open with the overview PowerPoint presentation on Julius Caesar provided here. Then, show the 45-minute National Geographic Documentary on Caesar and spend time reading Act I and Act II aloud in class. Next, show the five-minute History Channel Video “Coroner’s Report on Caesar" and assign a 30 minute writing task that students can email directly to you. Round out day one with assigning study questions for homework. Begin your second day by reading Act III aloud. Then, show students two video clips: Marlon Brando as Marc Antony and Charlton Heston as Marc Antony. Give another half-hour writing task based on the clips. Move on to a technology-focused assignment creating a storyboard. Finally, read the last two acts and give the questions for homework. It will be a two-day experience your students will never forget. • Complete Act I and Act II study questions. • Open by reading Act III aloud. Breakdown of themes in Mark Antony’s speech. • Writing Task Two: Imagine you were a citizen of Rome during the assassination of Caesar. Which Marc Antony speech, Brando’s or Heston’s, would motivate you to rise up against the action of the Senate? Reflect on your mood as you heard the speeches and the tone created by each actor. Thirty minutes to write and submit by email to teacher. • Technology Focus: Create an interactive storyboard that tells the story of Julius Caesar in six panels. Use one quote per panel. Use the online tool, storyboardthat.com. • Read Act IV and Act V.